Many of the pictures in Martin Kotler’s “Cityscapes” gaze down at Washington, but not from Olympian heights. 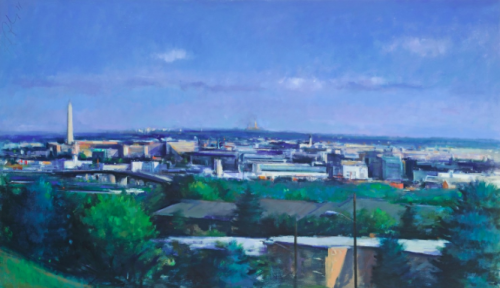 The longtime painter’s favorite vantage points include the bluff above Uniontown, Cardozo High School’s hilltop perch and an upstairs window that’s probably in his home. The artist depicts everyday aspects of the city where he has worked for more than three decades, so more dramatic angles would be unseemly. Yet Kotler’s canvases aren’t simply snapshots rendered in oil paints. They’re thoughtful and carefully composed, shaped by influences from both classical and modern art. A series of winter scenes from a block of exemplary D.C. rowhouses includes several titled “Hunters in the Snow,” after a Pieter Brueghel picture that’s a Kotler favorite. In paintings of the catenary wires and structures along the tracks near Union Station, the industrial landscape is rendered realistically, but the vertical towers and flat planes of color hint at abstraction. Such images are recognizably Washington, and also are specifically and inarguably Kotler’s.